A huge weekend is coming up that will decide just where the Southern California horses are. 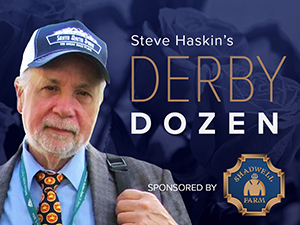 I’m letting horses like Caracortado, Alphie’s Bet, and Sidney’s Candy sort themselves out against Lookin At Lucky Saturday to see just which ones are leading Derby contenders. Another California horse who still can make a name for himself on dirt is Dave in Dixie, while Make Music For Me is heading to the Toyota Blue Stakes (gr. I). The intriguing horse in the Santa Anita Derby (gr. I) is Skipshot, who has won his last three at Golden Gate and most recently worked five furlongs in :58 2/5 at Santa Anita. We’ll also get a look at American Lion on the dirt for the first time in the Illinois Derby (gr. II). If he shows big improvement, he also will catapult back on the list. Backtalk is another intriguing horse heading for the Illinois Derby, as well as New York-bred Yawanna Twist, who ran a big race in the Gotham. And we also have Jackson Bend trying to prove he can handle top horses going 1 1/8 miles, as he takes on Eskendereya again and Awesome Act in the Wood Memorial (gr. I). Aikenite, who has been all but forgotten, has a chance to stamp himself as a legitimate Derby contender with a big effort in the Blue Grass. And watch out for Paddy O’Prado in that race. This horse could be very live and looks about ready to storm onto the Derby scene. I hated taking Pleasant Prince off the list, but I had to make room for Endorsement and Mission Impazible, and he might be iffy with earnings and no more races before the Derby. The other Ken Ramsey horse, Dean’s Kitten, looked good visually winning the Lane’s End Stakes (gr. II) over Northern Giant, but he was beaten 33 lengths in his only dirt start. Connemara lost way too much ground in the Lane’s End and could only finish a well-beaten third. I have no idea where he stands now and what to make of him, but wouldn’t be surprised to see him run much better than expected in the Derby in his first try on dirt. He hasn’t run big speed figures, but don’t give up on him just yet. With the Florida Derby finish enhancing his reputation even further, he heads into the Wood Memorial as an overwhelming favorite and will provide a good gauge on the merits of his main foe Awesome Act. He’s been freshened and should be sitting on another huge effort. Baffert said he’s 90% sure he’ll stay home for the Santa Anita Derby. It’s not your typical preparation going into the Derby, bouncing back and forth between synthetic and dirt, but the timing is right and he’ll get tested by some new faces. He definitely is the most solid and dependable horse on the Derby trail. Keeping him where he is for now, even though he hasn’t worked since the San Felipe. He is, however, listed as a probable starter for the Blue Grass Stakes. Would have rather seen him on dirt, but he at least should get a good prep out of it and is certainly good enough to win it. Next step is to see a work from him. If he can be competitive with Eskendereya in the Wood Memorial, he will establish himself as one of the top contenders for the Derby. Remember, a slight bounce off the Gotham is understandable. If he shows enough to move forward he could be on course to peak on Derby Day. The key will be the six-week layoff and whether he can make up a dozen lengths on Eskendereya. He does have the foundation, with three nine-furlong races this year and five career starts at a mile or longer. With all the speed shaping up, the Derby could set up well for him. He worked six furlongs in a sharp 1:11 3/5 and should have no excuses in the Arkansas Derby, as long as he gets a decent ride and an uneventful trip this time. Then we’ll know once and for all just how good he is. He’s been asked to do an awful lot in his last two races. Could it be, with all their big 3-year-olds, this is WinStar’s main Kentucky Derby prospect, coming out of the woodwork to blow away undefeated Conveyance in the Sunland Park Derby and looking awfully good doing it? He’s always been well regarded and loved his inner splits of :23 3/5 quarters and solid come-home time, doing it with relative ease. This is a great break for Shannon Ritter, former exercise rider of Victory Gallop, Menifee, and Distorted Humor. He’s a tough competitor who must be respected wherever he runs, but he still has to show signs he will be able to handle 1 1/4 miles, especially off only two starts at 3 and a pedigree top heavy with speed influences. He will need to depend heavily on his strong tail-female family, which is all Darby Dan stamina and class. He received a form boost when Exhi, whom he destroyed by 15 lengths in his Tampa allowance victory, came back to win the Rushaway Stakes. It has been decided to run him the Blue Grass, which is an excellent spot for him to use strictly as a prep. It will allow him to get another race in and not have to go all out. He certainly doesn’t have to win. Turned in yet another sharp work at Tampa, drilling a half in :46 4/5, indicating he bounced out of the Tampa Bay Derby in excellent shape. The Illinois Derby should be a good spot for him, and more improvement is expected. In addition to picking up much-needed earnings, he basically needs to show he can put good horses away after having them on the ropes. (Late news has come in that he will now run in the Wood Memorial). His Louisiana Derby victory was no surprise off his sneaky good fourth in the Southwest Stakes, in which he re-rallied in the stretch. He did the same at Fair Grounds, although the leaders looked as if they were backing up as well. Fair Grounds 3-year-old form has not held up all that well in out-of-town stakes, so we really don’t know who he beat. Runner-up was stretching out from sprints. But there is something about this horse I’ve liked and he is improving quickly at the right time. From a WinStar perspective, it’s a toss-up between him and Rule. He gets on here because he still has one more opportunity to show what he can do rating off the pace. Although nothing has been decided, he most likely will head to the Arkansas Derby. He was my initial #1-ranked horse back in early December, so let’s see if he can do enough to get back to where he was.